Spray grill rack with nonstick nonflammable cooking spray. Preheat grill to medium high heat (350 degree to 400 degree ). Grill asparagus, covered with grill lid, for 1 ½ to 2 minutes on each side. In a medium bowl, toss together tomatoes, 1 tablespoon olive oil, lime juice, ¼ teaspoon salt, and ¼ teaspoon pepper. Rinse fish, and pat dry. Brush fish with remaining 1 tablespoon olive oil, remaining ¼ teaspoon salt, and remaining ¼ teaspoon pepper. Grill orange roughy, coveered with grill lid, for 2 to 3 minutes on each side, or until fish flakes easily with a fork. 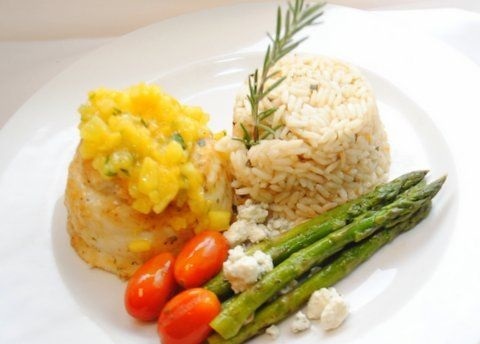 Serve with asparagus and tomatoes. Garnish with lime wedges, if desired. Note: To grill lime wedges, grill for about 30 to 45 seconds on each side. End.